This outline alphabet seem to have "weight" by roping off some space rather than filling it with color. It will work well where the letters need to fill an area but you don't want to overpower the surrounding design elements. Of course, if you like the letters but want them filled in, you can certainly do that, too. Click here or on the picture above for a printable PDF pattern for Alphabet 11. A new window (or tab) will open so you can keep your place here. 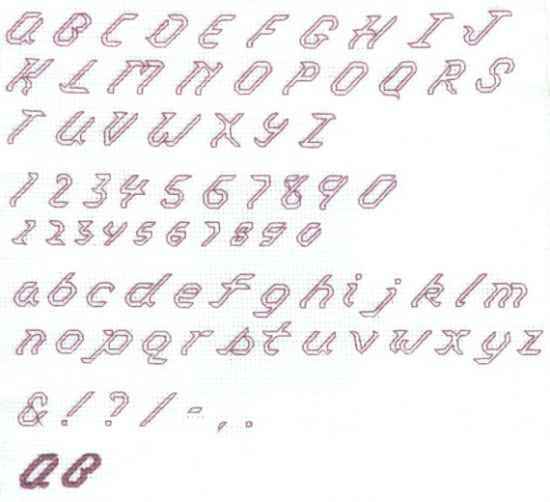 The Outline Alphabet, as shown in the photograph, is stitched on 14-count Aida using DMC floss. It was originally designed to be stitched in outline, using backstitches alone. However, it can also be filled in with cross stitches. You can see an example in the letters "A" and "B" stitched at the bottom of the chart..
Because they are thin and slanted, the majority of stitches used to fill in these letters will be partial stitches. You can choose whether to use 1/4 cross stitches or 3/4 cross stitches. For a 1/4 cross stitch, the backstitch outline completes the diagonal side, and will result in thinner, more angular letters. The 3/4 cross stitch includes the diagonal side, and your letters will look fuller and rounder. The fabric and floss strand count may affect your choice. If you are uncertain which to use, try stitching a few sample letters in the corner of your fabric. Learn any unfamiliar stitches by clicking on the "How To..." button on the left menu or the Better Cross Stitch Patterns Home page. Feel free to change the floss color to reflect your tastes and to coordinate with the rest of your project. Use the same number of strands that you are already using throughout the rest of your cross stitch pattern. These letters are thin and slanted, making it easy to "nest" them. If space is at a premium, you can easily place them with merely a stitch between. There are other tips and tricks to selecting and adapting cross stitch alphabets. See Alphabet 123's on the menu on the left.